A slew of words bubbled up in this reviewer’s mind after the screening of Damsels In Distress, itself a film of notable verbosity. Words like satire, farce, deadpan, social critique, soap opera/daytime tv movie, dry, Aspergers, absurdism. Each applies in its own way, but Whit Stillman’s latest synthesizes them into a sprawl of social observances. Damsels introduces Violet (Greta Gerwig), Heather (Carrie Maclemore), and Rose (Megalyn Echinkunwoke), three unconventionally conventional girls attending Seven Oaks college. The three, dressed in prim and conservative pastel dresses fit for a 1950’s television show, run a Suicide Prevention service in order to stop depression once and for all. Despite their earnest intentions, they are read by their fellow students as somewhat cultish, egoistic, judgmental, and generally….crazy. Along comes Lily (Analeigh Tipton), a transfer student. Lily accepts the trio’s bid for friendship and advisement, and the rest is a poker-faced antirealist foray into the twentysomethings’ universe, a demographic within which Stillman seems to dwell so happily. Damsels spares no expense in its scathes, which cover as many flawed characters and as much social critique in an hour and a half as Japanese director Shion Sono does in four frenetic hours with his film Love Exposure (2009). The content of the film speaks for itself, as concepts like “truth in clichés,” “the absurdity of optimism,” “moral hypocrisy,” “the theatrics of identity,” are expressed out loud without restraint. What’s most alluring is the film’s tone. It has the linguistic clip of a noir, the luster of a Soap, the cast of a teen movie, and the self-conscious self-analytics of a Dawson’s Creek episode. Such a spread of tons, yet they blend into a strange and hilarious creature. Stillman’s use of character cliché’s throughout (something that reminded me of Gus Van Sant’s film Elephant) helps to structure the film’s gradual discussion of “found identity,” and the performative aspect to everyone’s self-presentation…and how sometimes the performance is even for the self. Terms like Autism and Aspergers are becoming forefront conversation topics, and popular media have been doing a commendable job of incorporating those types of realities into characterzation; thinking recently of Max from the show Parenthood, which could easily include someone like include Sheldon from Big Bang Theory. The utterly detached frankness of Stillman’s Damsels bring this to mind as well, particularly Violet. Stillman writes her with such witticism, sharpness, and yet obliviousness, that she could almost be diagnosed from across a room. After seeing Damsels – more importantly hearing it – one can’t help but think that, not only had the 14 years since Stillman’s last picture informed the content of the Damsels (which seems to exist somewhat “outside of time” by lacking specific technological markers), but the sheer bevy of sculpted dialogue seems to have demanded as much time. It is a joy to listen to, with just enough earnest sweetness to balance out the existential urgency of Damsels (girls and boys alike) forming personal philosophies, shoring up emotional defenses, and surviving the tides of young adult life. 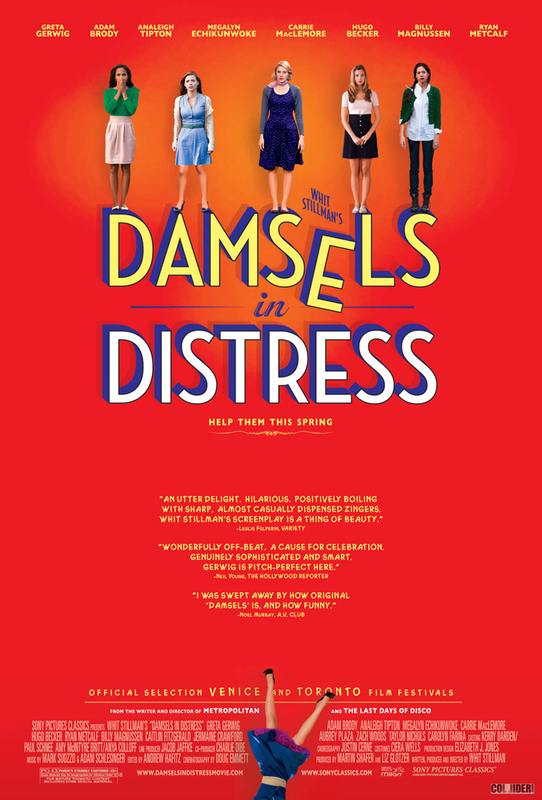 Damsels in Distress opens today at the Ritz Five.